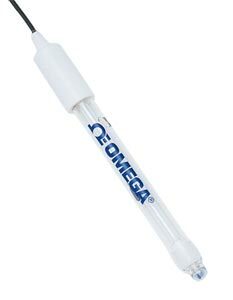 OMEGA’s glass-bodied, refillable (RF), combination pH electrodes are for general purpose laboratory measurements. The inert nature of the glass body allows these electrodes to be used in aqueous and non-aqueous solutions at temperatures up to 110°C. The PHE-1479 has a ceramic liquid junction and a saturated potassium chloride electrolyte. This electrolyte is a laboratory standard and is suitable for most measurements. The ceramic junction has a low flat rate which minimizes sample contamination from the potassium chloride solution. The PHE-1478 has a Porous PTFE liquid junction and a saturated potassium chloride electrolyte. The Porous PTFE liquid junction provides a stable, non-fouling reference contact ideal for the most demanding applications. This research grade electrode should be used when the sample has a very low or very high ionic strength, where greases or oils are present, or in biological solutions containing TRIS or large amounts of protein. These specialty electrodes are designed for surface and subsurface measurements of semi-soft materials. The typical applications include meats, cheese, dairy products, photographic emulsions and electrophoresis gels. The Flat is a refillable combination pH electrode with a polymer body, Porous PTFE liquid and a flat pH glass membrane. It can be used to measure the pH of any moist surface or inverted and used as a “one-drop” electrode. Samples as small as 100 microliters are easily measured with this inverted technique. The Spear-Point is a refillable combination pH electrode with a 9.5mm glass body, Porous PTFE liquid junction and pointed pH glass bulb. It is designed for sub-surface measurements of cheese, processed meats and other soft materials. These electrodes respond quickly and are easily cleaned. For non-standard cable lengths, change the "-10" in the model number to the required length in feet, add $2 per foot to price (additional per foot cost applies to the entire length of cable. For HF/Fluoride Resistant electrode, add suffix "-HF" to model number, add $50 to price. PHE-1526 not available with any options. For high temperature reference cell, add suffix "-HT" to model number, add $35 to price. Available on the PHE-1477 and PHE-1525 only.